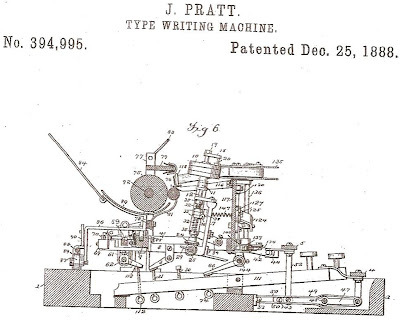 The first inventor to receive a US typewriter patent as a Christmas Day gift was John Jonathan Pratt (below), in 1888. 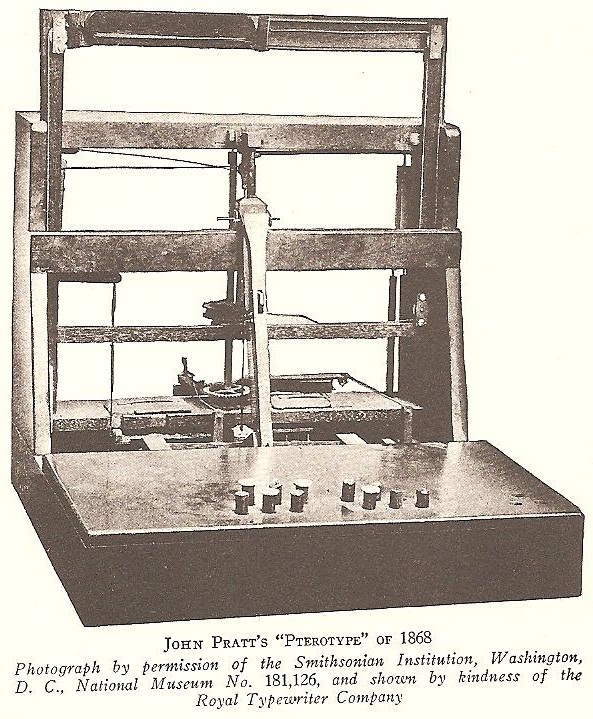 Pratt was one of the great pioneers in the early development of the typewriter. 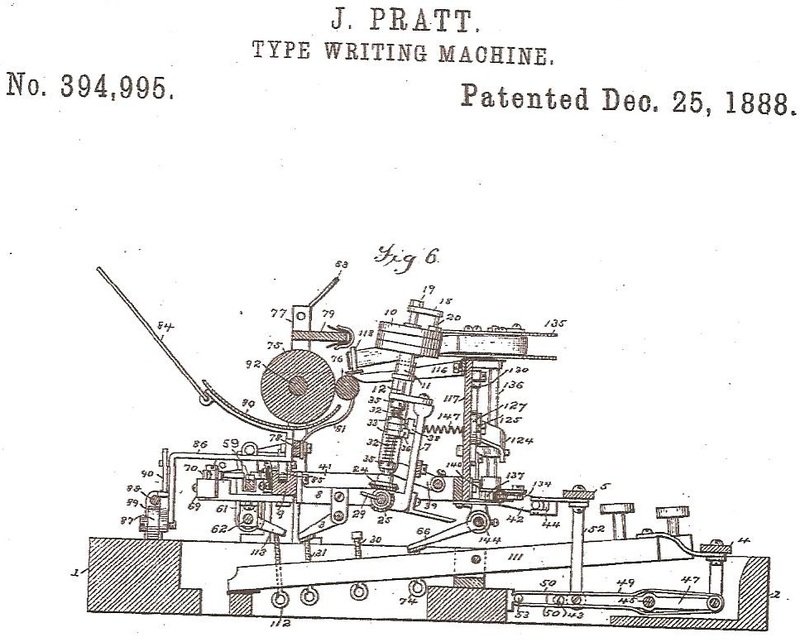 Three further Christmas Day typewriter patents were issued by the United States Patent Office in 1894. 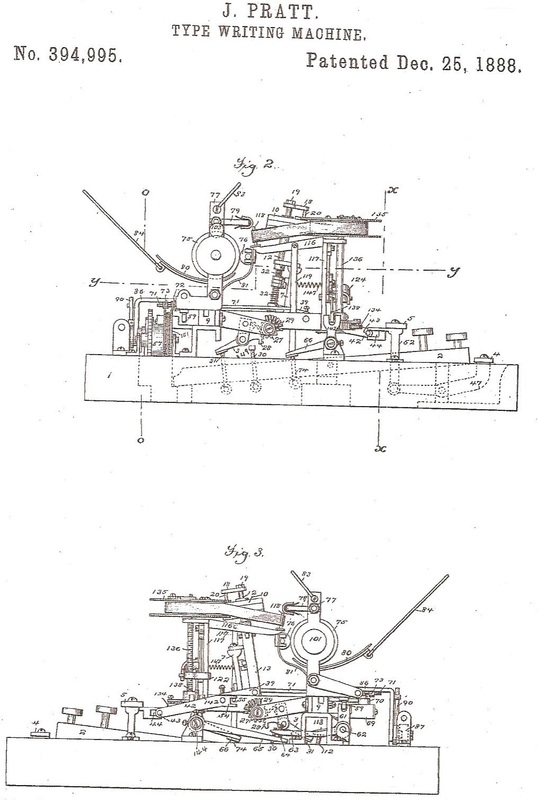 These went to Marshall Wier, of Kingston-Upon-Thames in England, for the first of his pneumatic typewriters, to Austin Lowe, of Minneapolis, Kansas, for a typewriter allowing a “plurality of typebars operated by a single key”, and to English brothers Thomas George Daw and Hilder Daw. Thomas Daw was a newspaper proprietor and publisher and Hilder Daw a printer and publisher, of Quakers Hall, Sevenoaks, Kent. 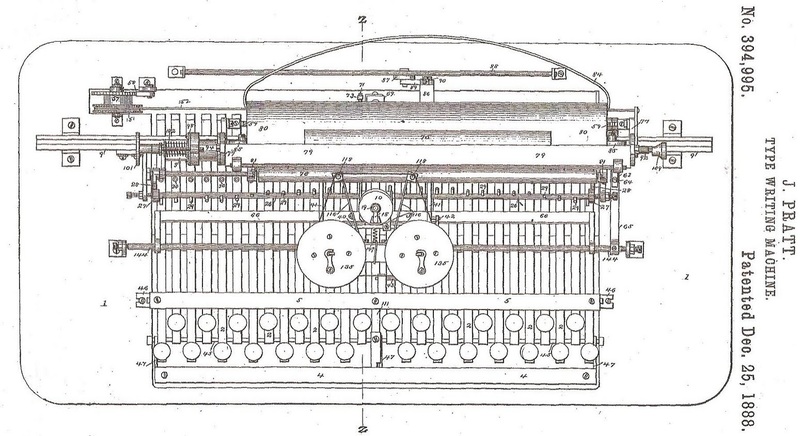 Their typewriter doubled as a maker of stereotype-matrices. Wier (correct spelling, not Weir, as most typewriter histories have him) was the first inventor to develop the idea of pneumatic typewriters. We shall return to an in-depth study of these machines soon (I have been meaning to do it for some months now, but the Christmas Day Wier patent has finally prompted me into action). Pratt is most famous for inventing the Pterotype (“winged type”), which he first patented on December 1, 1866, while living in England. He built the first model of it in Centre, Alabama, in 1863, but as a Southerner could not get a US patent for it until after the Civil War. Pratt and his wife returned to the US in 1868 and Pratt gained a US patent for his “Improvement in Mechanical Typographers” in August of that year. When publicised in the US, the Pterotype inspired the start of work on the Sholes & Glidden in Milwaukee and was itself shown at the 1876 Philadelphia Centenary Exhibition. 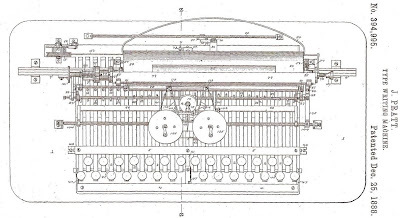 Pratt sold the rights to his single type element component to James Bartlett Hammond, who used the idea for the typeshuttle in his Hammond typewriter. 1. To cause the type-carrier to automatically strike the platen. 2. To improve the mechanism for moving the type to the impression-point and there arresting it, and also for adjusting easily and conveniently its position and the moment of its placement. 4. To improve the arrangement of the keyboard with reference to the compound movement of the type-carrier. 5. 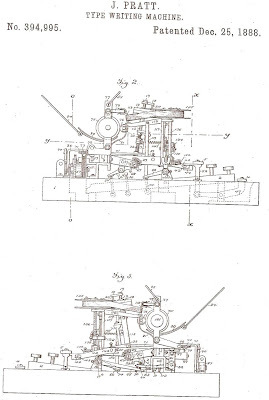 To improve the mechanism for detaching the feed-gearing of the paper-carriage. 6. To improve the paper-carriage. 7. To automatically shift the ribbon-spool mechanism. 8. To automatically move the ink-ribbon in and out of the field of impression, so as to display each impression as soon as made. 9. To automatically prevent the type from making an impression when the space-key is struck. John Jonathan Pratt was born in what was then called Unionville (now Union) in South Carolina, on April 13, 1831. He graduated from Cokesbury College in Greenwood in 1849, then moved to Alabama with his family and read law under Judge Benjamin Franklin Porter in Greenville. He married Julia R. Porter, the judge's daughter, and in 1853 the couple moved to Centre. Pratt was a school teacher, a lawyer and newspaper editor. By 1880 Pratt was living in Cherokee, Alabama, as a “retired lawyer”. He moved to New York in 1886. 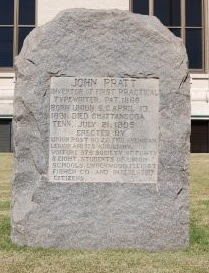 Pratt died in Chattanooga, Tennessee, on July 21, 1905, and is buried in Centre. In his honour, the Business and Professional Women's Club of Centre created Pratt Memorial Park at Pine Knoll. Sent in a guess - hope it gets to you, I'd hate to be late just because I was avoiding posting my guess.